It took awhile, but Fall has finally found it’s way to Houston and into the HWH household! Well, the front porch at least! I’m one of those people that loves to embrace every season of the year, but there’s something extra special about Fall. It’s the beginning of cozy and as the daylight starts to end sooner, we start nesting inside and enjoying the comforts of home even more. On a chilly morning, I savor my hot cup of coffee and enjoy every last sip- sometimes outside while the weather is crisp and cool. We snuggle a little longer on the couch in cozy blankets. Good morning and Happy Thanksgiving! We’re about to head out to my sister-in-law’s, but I couldn’t let today pass without wishing y’all a wonderful day! I hope you spend it with your loved ones- eating, relaxing and just enjoying the day! I’m so thankful that we get to meet here and that this blog allows me to be home with my kids while they are young. I couldn’t be more grateful for that! Here’s to our health and happiness and this holiday season! Here’s to a fresh, new week! This weekend, we went to a fun pumpkin patch with pony rides, a haunted trail, petting zoo and face painting and even managed to get a family photo with everyone in it! That never happens! It’s been challenging to get stuff done around here with having to watch our baby so closely. She’s everywhere and at that stage where she has no fear and can easily get hurt. I’m always on high alert and her energy seriously wears me out! That’s life with a baby for ya! 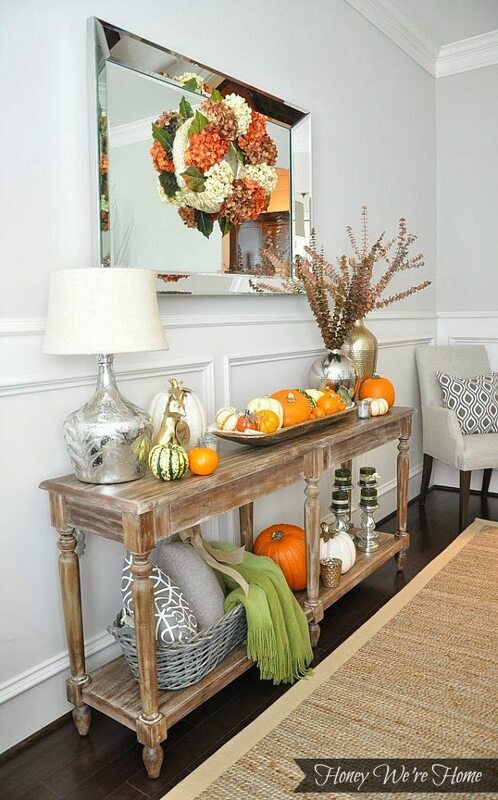 At home, I did manage to put the finishing touches on our Fall dining room and even got it photographed for ya! I’m sure you’ve noticed it’s been awhile since I’ve done any decorating around here! The last major project was my office and I’m still enjoying it so much! I’m actually sitting at my desk right now typing this with my cup of coffee close by! We have so, so much to be thankful for. First and foremost, I’m thankful that I can even feel thankful right now after such a hard loss this year. It was only 8 months ago that we lost our Dad and not a day goes by that we don’t think about him and miss him. He added so much to our family and his absence this Thanksgiving will surely be felt. I have sweet, sweet pictures of him and my Mom cuddled up on the couch from last year’s Thanksgiving and even though he was frail and missing hair, their love was strong as ever. Happy almost Thanksgiving! Any chance you’re looking forward to it and maybe a little overwhelmed as well?! Me too. Even though we’re not hosting, we’ll be visiting two Thanksgiving celebrations and I’ll be bringing some appetizers and desserts. I still need to grocery shop and I’m sure the stores will be buzzing with tons of last minute shoppers like me. How was your weekend friends?! Mine started and ended with some much needed girl time where we got together to celebrate one of my closest girlfriend’s birthday. Although we really blew it out last year for her 40th in Las Vegas, this year was low key but so nice with a beautiful outdoor lunch Friday at Backstreet Cafe and then a dinner on Sunday at Salt Air- two great restaurants to try if you ever get to Houston. Sometimes I get so busy with my day-to-day life and responsibilities that it’s hard to carve out that friend time. But, it’s so necessary. We’re edging closer to Thanksgiving and I’m getting excited! My son has the whole week off school, so it will be great to get to spend that extra time together and lounge around in pajamas longer than usual. We don’t have any plans for the beginning of the week, but we’ll probably have friends over (especially kids whose parents have to head to the office). Are your kids out that long? I mentioned earlier that we’ll be splitting Thanksgiving day into two trips (one to my parents’ house for a morning brunch and then to my sis-n-law’s house for lunch/dinner). Two big Thanksgiving meals in one day calls for stretchy pants! Even though we’re celebrating Thanksgiving dinner away from home, I couldn’t help but set a small Thanksgiving table for myself (and you!) to enjoy. I’m thankful for this blog so I have an excuse to put together holiday decorations like this to share. 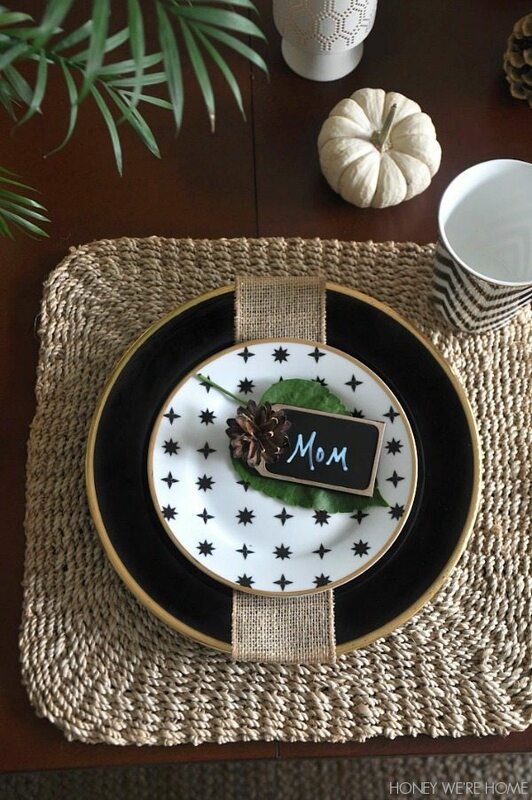 This table was inspired by nature and the fabulous dessert plates by Nate Berkus. I was lucky to get one of the last sets currently in stock at my store. His stuff goes fast in Houston. In your town too? I mentioned recently how our evening routines have changed lately. I used to be so bad about burying my head in the computer as soon as my son went to bed, but now I’m shutting it down earlier and having more relaxing evenings. Said evenings often include The Voice (#teamGwen! ), Parenthood, and the occasional New Jersey, OC, and/or Beverly Hills Housewives episodes (#hangsheadinshame). One thing I’m not embarrassed to admit is that I love to create a soothing space to do this relaxing in. I spend a few minutes picking up toys and throwing them into baskets and then light a few candles to set the mood. 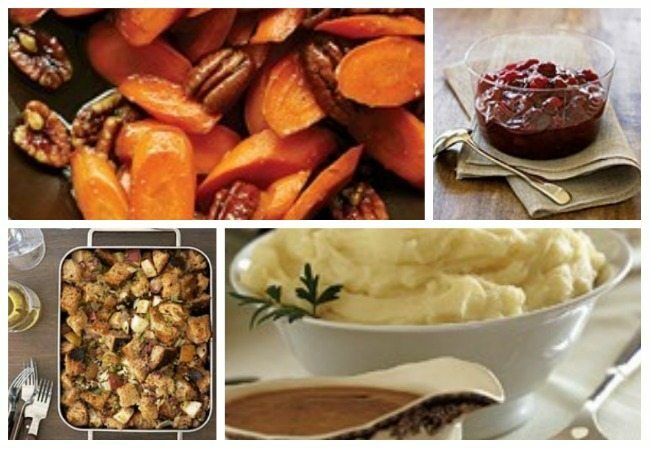 It’s about this time of year that we start planning what we’re doing for Thanksgiving. As you might know firsthand, it can get complicated to try to spend time with everyone on both sides of the family on one day, but we always make it work. I have two brothers, both with significant others whose families are in town as well, and my hubby’s sister lives close and her husband’s family is also here. So, we typically do Thanksgiving at my sis-n-law’s house in the early afternoon (with her now three kiddos, her husband’s parents, and my in-laws if they’re in town) and then head to my parents in the evening to be with my siblings and their kiddos. After pulling out two bins of Fall decor last weekend, I wasn’t really feeling it. So, I let it sit a few days until the mood felt right. When I came back to it this week, the process unfolded naturally and didn’t feel “forced”. This is the way I like to decorate. 🙂 I added the usual Fall decor suspects- pumpkins, pine cones, apples, flowering branches (real and faux), and a new “cayenne and ivory” throw blanket that I’m crazy about. I spread the Fall love throughout the house and had the best compliment from my girlfriend who came to visit from out of town. Was the first day of Fall as gorgeous in your city as it was here?! We got to experience a significant drop in temperatures and a morning without humidity- pretty near perfect! In honor of the official start of Fall, I put together a “rustic glam” mantle. Of course, we don’t really have a true mantle, so our console table subbed in. I got some glam inspiration from this little fox I found at Target. Have you seen him yet? I passed him up a couple of times, but recently couldn’t resist. Foxes are the new owl. This year, our Thanksgiving table was inspired by all the luxurious shiny gold I’m seeing and loving these days in fashion and home decor. The place card for the table (a spray painted pear and computer-crafted label) sparked the idea. Now that Halloween has passed, I don’t feel so bad about getting busy planning for Thanksgiving! The recent issue of Food & Wine magazine has me giddy to get cooking! In our family, we typically visit my husband’s sister and her family in the early part of the day and then go to my parents’ house, but I always like to contribute to the meal at both get-togethers. At my parents’ house, we have fallen into a pretty comfortable Thanksgiving menu, that I’ve listed below, and I try to add something new to the mix.